Well, at least Chloe gave it a decent shot. Also, I’m fairly sure this is the first time Aram’s taken a hit so far. And it’s friendly fire, of a sort. This is what happens when you wade through a sea of Goblins without much trouble, though. Eventually, someone in charge has to come out and put a stop to the fun. As I’ve said a few times already, this issue will mark the end of the first Of Stars and Swords story arc. While our main focus is, of course, getting it finished, both Caroline and I have started some very early work for our second arc. What does this mean for you? Well, not too terribly much from the writing end to be shown, but as we get closer to the end of this issue, we’ll start showing off various bits of concept art on the art blog! In addition, Cato’s story on the prose site will be coming to an end at the same time as Issue 5 does. I apologize for the lack of updates over our between issues break, but that will be remedied with sporadic updates between now and the end of this issue. Why? Well…both stories are going to end in about the same place. However, the prose bits might be a little further ahead in some aspects so I’ve had to slow down on that end. 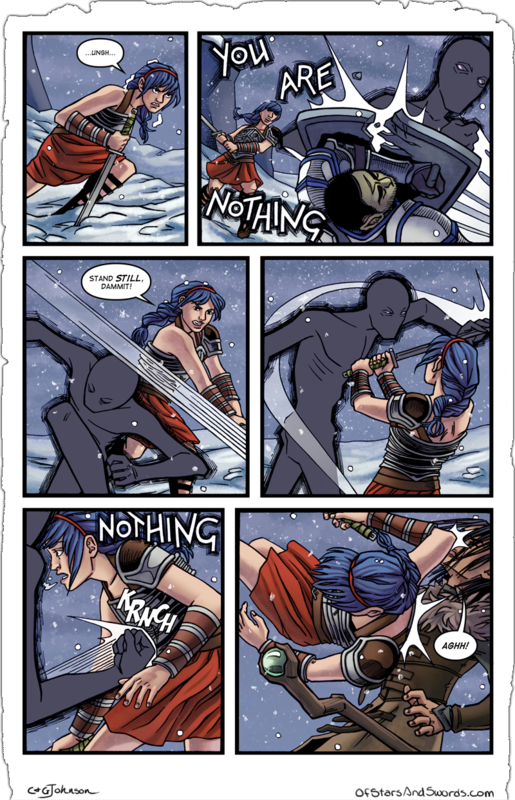 As always, Issues 0-3 are available on Comixology. Issue 4 is on the way, but it’s currently only available on our Gumroad store, completely DRM-free along with all the other issues!